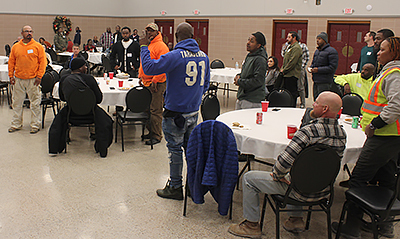 Over 30 graduates of the Building Union Diversity (BUD) program, plus friends, union officials, and other program organizers and supporters of the program gathered at Carpenters Hall on Hampton Avenue Thursday night to celebrate five years of success for the program. Since starting in 2014, BUD has conducted 14 cohorts of program participants. As of October, 162 persons had started the the program, with 142 completing (88%) and 120 placed in positions (85%). The percentage of minorities enrolled in the program was 83%, with women representing 17% and veterans 6%. BUD program leaders Thursday night. 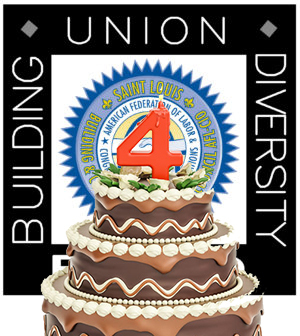 The BUD program was launched in 2014 to bring more minority and female workers into the union trades in a partnership between the Building & Construction Trades Council, the Eastern Missouri Laborers District Council and the St. Louis-Kansas City Regional Carpenters, with funding from the St. Louis Agency on Training and Employment (SLATE) and the Missouri Division of Workforce Development. Local unions open their training centers for the pre-apprentices during the five- to eight-week program to give them basic training and a feel for each of the trades. United Way and Metro also help, providing participants with transportation and assistance with other needs that may be preventing them from getting or keeping a job. 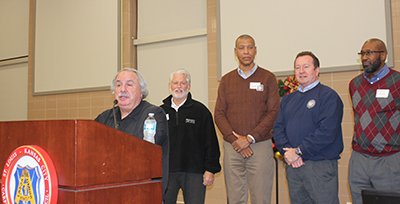 John Stiffler, executive director of the St. Louis Building and Construction Trades Council credited the carpenters, laborers and other unions, as well as partners such as the United Way and St. Louis Community Credit union with stepping up to help build the program over its history. BUD grads report on where they are currently working. Russ Signorino, program director for BUD, cited recent improvements to the program, including partnerships with Lyft and Metro Transit and increased financial literacy and lending services from St. Louis Community Credit Union.